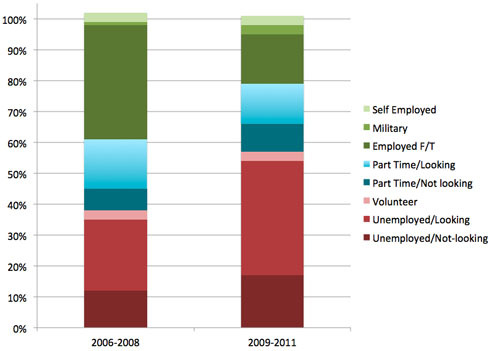 The chart below shows the effect of the Great Recession on high school grads entering the workforce. Back in 2006-08, about 60% found work of some kind right after graduating. Since 2009, only about 40% have found work. This is a staggering waste of human potential, and almost certainly a lifelong burden for these workers, since abundant evidence suggests that starting out your working career either unemployed or in a low-paying job leads to lower pay throughout your entire life. Having the bad luck to graduate in 2009 will probably cost these kids something close to half a million dollars over the course of their lives. The data comes from a report by the John J. Heldrich Center for Workforce Development at Rutgers University. The chart comes from Stuart Staniford.